Anyone love candy? Well I do, recently I was contacted by Gummy Munchies to share the news of their new subscription services. So that is what I will be sharing with you today. Of course I checked out their website as well & will share some useful information with you. (The information shared below in the bullet list has been copy & pasted directly from the email I was sent. Discovery - We also offer 'surprise' options where customers can choose to receive a monthly surprise of either sour, classic, sugar-free, or a mix of it all. Yummy Gifts - It's hard to be upset when you have a bag full of gummies at your doorstep. Customers can send personalized messages to their friends and loved ones with every gift order. Convenience - All gummies are packaged and sealed in our beautifully designed moisture resistant foil pouch and shipped in an insulated box to ensure quality freshness while in transit. So after I received the email I went exploring on their site. First stop candy! To be 100% honest with you when I read the line "Customers can pick and choose from our wide selection of gummies" I got super excited because I am always looking for new goodies to try. However I was slightly disappointed because when you first arrive on their site you see a photo with really cool looking candy but then when you go to their shop there's not much.& nothing too unique. * I contacted them asking "Is there more inventory that has to be uploaded?" They're response was "Yes, we currently have over 20 options to choose from however our inventory list will continue to grow as we move forward." Maybe I've just been spoiled with my candy selection though. I live in a city which is perfect for my sweet tooth. I live close to a Bulk Barn which is a Canadian bulk food retailer, as well as a shop called Sugar Mountain which is a place you can purchase international candies &/or buy candy by the scoop. However the Bulk Barn nor Sugar Mountain deliver. So I checked out the delivery fees. To myself in Ontario, Canada shipping would be $12.95 which is sadly more than the cost of the product which is often a deal breaker for me. So I wanted to see how much product I would be receiving to see if it would be worth, so I'll be talking about that after I talk about US shipping prices. 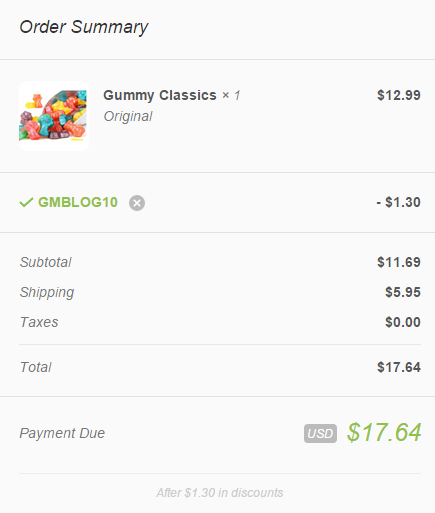 After I posted this story Gummy Munchies contacted me to let me know that they have changed the shipping rates for the US, Canada/International addresses. The Canadian/International rates have been lowered by at least $5.00! 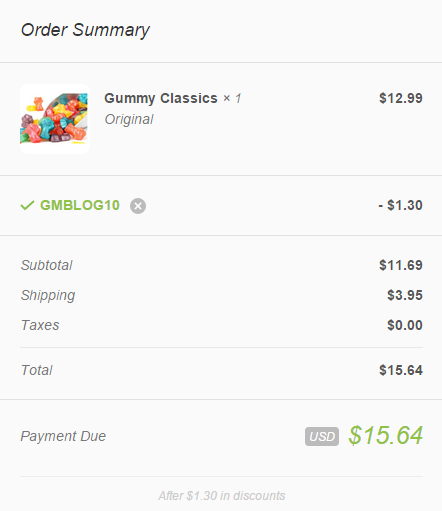 & the US shipping was lowered by a dollar. So now with shipping being much more reasonable, I would gladly recommend to to friends & family as well as my Canadian/International readers ! Because I live in Canada & shop online I have realized shipping to Canada costs much more than it does within the US, so I put in my fathers address who lives in California. The shipping cost to my father came to $3.95, which is significantly lower (& extremely reasonable in my opinion) than to Canada. So after checking out the shipping prices I wanted to see how much product you get by checking out their FAQ page which was pretty helpful. How many gummies are included? 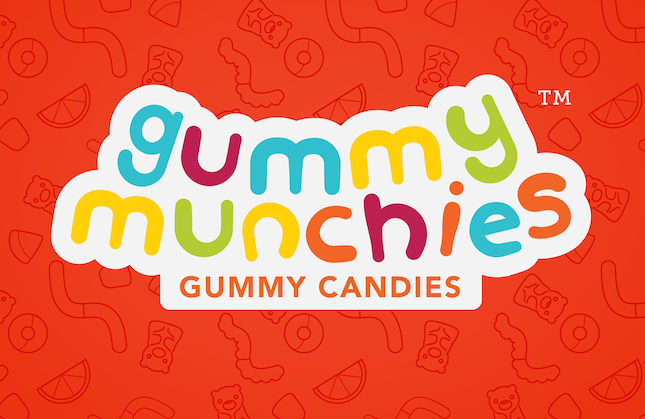 Our regular size gummy munchies weigh approximately 12oz, the ‘MiNi’ version weighs 5oz, and our 'Orange Label' tin weighs approximately 4oz. Which isn't a lot. I totally understand that some of the fee is going towards packing materials & they obviously need to make some type of profit. However I just think that for the prices it all goes back to the uniqueness of the candy. I also just wanted to let you know that they have a Refer a Friend Program which is always something I appreciate in a company. Please let me know if you decide to give them a try! 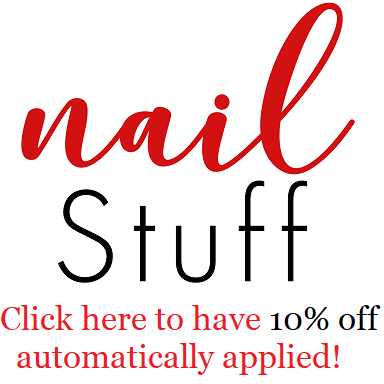 I would love to hear your thoughts & opinions on the product, prices, & services!